The GE Vivid 5 ultrasound is an entry-level, cardiac-specific ultrasound machine. 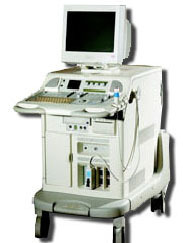 As a console machine, however, this ultrasound is surprisingly small and lightweight machine, making it mobile enough for many environments and applications. The overall initial image quality and its available image enhancement capabilities provide the tools needed to obtain incredibly accurate information from the raw data.